Looking to hire a marquee in Norwich? We all know the British weather can sometimes be unpredictable. 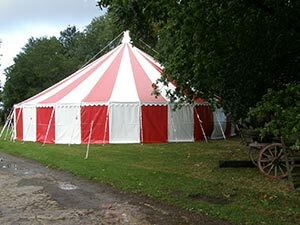 Outdoor events with marquees can be ruined if a heavy downpour causes a washout in a marquee that’s not erected properly, or that’s not of a decent quality. High winds can also be an issue, whilst at other times staying in the marquee is like spending time in a sauna. Our Weatherills traditional marquees are manufactured from a breathable cotton canvas that allows party-goers to stay cooler in hot summer weather, and our modern PVC marquees have tight fitting panels that prevent sag and pooling in heavy rain. We are also one of the UK’s only marquee companies to wind test our products to 80mph, giving you added peace of mind if inclement weather arises. You can reach us on 01953 882 394 or email sales@weatherillbrothers.co.uk and we’ll let you know how we can help. If you want to find out the price of hiring a marquee for your event in Norwich, give Weatherill Brothers Marquees a call on 01953 882394, because nobody knows marquee hire in Norwich like we do. We’ve been involved in the manufacture, sale, and hire of marquees since the 1950’s, and have been based just outside Norwich in Watton, since 1981. Our company roots go back even further to Windsor in the 1800’s, so we’re a long standing family business with a strong reputation for quality and service. Because we have so much experience in hiring marquees to venues and individuals for special events, we can take a lot of the stress away from you, the event planner. Our marquees are top quality, and our service is second to none. Working closely with us will allow you time to relax and enjoy your event, so call us now on 01953 882394. We’re open from early in the morning to take your call.